Halve bok choy lengthwise and rinse; cut crosswise into 1-inch pieces, keeping bulbs and leaves separate. Rinse remaining produce. Trim and discard Rinse remaining produce. Trim and discard scallion root; thinly slice crosswise on a diagonal, keeping whites �... 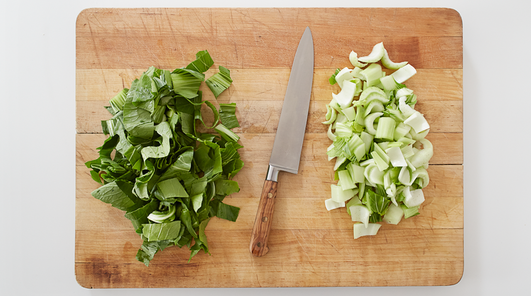 Trim the stems off the Bok Choy and separate the leaves, clean & drain. Chop into smaller bits on the diagonal. Finely mince garlic, ginger and shallot. Hi Elaine, Garlic bok-choy is a favourite in our household too. My two cents would be to use mushrooms (especially trumpets or shitake) in place of animal fat for a vegetarian version. I typically add mushrooms to both bok-choy and cabbage and a splash of chicken broth. Trim and discard the thick base of the bok choy. Slice off the bottom 1/2 to 1 inch (1.3 to 2.6 cm) with a sharp knife just above where the base of the leaves connect. Pull off and discard any outside leaves that are discolored or particularly tough.